When the electronic logging device mandate finally takes effect in December, freight hauling capacity will tighten and spot market rates are likely to rise, according to trucking industry analysts. The mandate could result in a 7% loss of capacity in the for-hire carrier sector, with a 3.7% loss for the industry overall as some drivers no longer will be able to fudge their paper logbooks and therefore spend less time on the road, according to ACT Research President Kenny Vieth. Other industry veterans and observers agree that capacity will tighten and spot rates will rise. Customer surveys conducted by Truckstop.com, a load board operator that primarily serves owner-operators and small carriers, have shown a 2-4% capacity reduction, but “doomsday” predictions are much higher, said Thayne Boren, general manager of Truckstop.com’s mobile division. He and the company’s chief economist, Noel Perry, say rates could increase 20% year-over-year at peak seasonal times. The mandate already is having an effect on the spot market ahead of the ELD implementation deadline. That’s because shippers and brokers are trying to procure capacity due to the uncertainty and before rates spike, Boren said. Meanwhile, capacity has been removed from the market as carriers make the transition. Brad Delco, a transportation research analyst at Stephens Inc., an Arkansas-based financial services firm, said the trucking industry is so large and fragmented that it can absorb gradual changes in supply and demand. Spikes are caused by disruptive events, and the ELD mandate could be one. “We think this can be the shock and awe that causes capacity to really tighten,” Delco said. Mark Montague, industry pricing analyst for load board operator DAT Solutions, said most industry experts predict a 3-5% impact on carrier productivity overall, though the effect will be uneven. The impact will be felt most acutely on one-day hauls of more than 450 miles, Montague said. When ELD requirements push trips to a second day, appointments will have to be rescheduled and reloads missed. Kevin Zweier, vice president of Chainalytics’ transportation practice, said shippers’ transportation budgets were down 1-3% in 2016. While 2017 has been mostly flat, upcoming increases could cause budgets to finish the year 1-2% higher. That will bleed over into 2018, when truckload rates could rise 2-5%. When Schneider switched to electronic logs in 2010, it saw a 4% productivity loss even though it had previously passed a Department of Transportation audit using satellite technology to check its paper logs, Chief Operating Officer Mark Rourke said. Green Bay, Wis.-based Schneider ranks No. 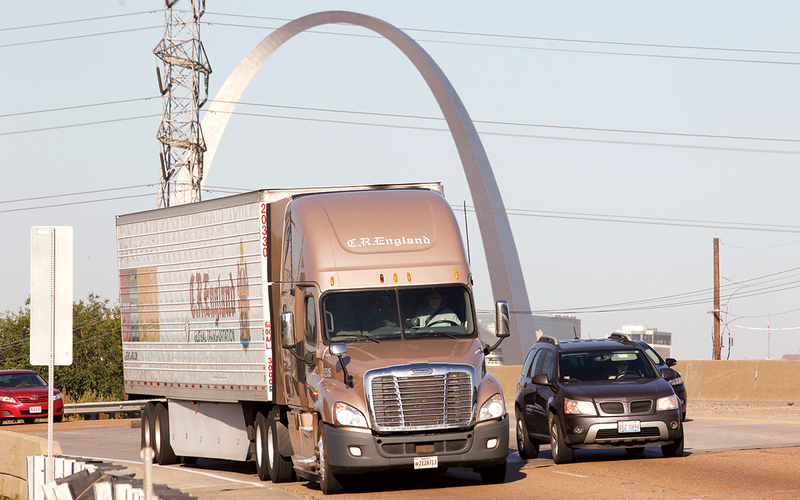 6 on the Transport Topics Top 100 list of North American for-hire carriers. Rourke compared the impact of ELDs with the Commercial Vehicle Safety Alliance’s annual Roadcheck event, during which law enforcement officers emphasize inspections that historically have resulted in productivity losses. The ELD mandate will have at least that much of an effect, he said. The spot market will be much different by March, with the contract market lagging but not by much, Rourke said, referring to January and February generally being slow months for the freight industry. Rourke said the switch to ELDs will be a big adjustment. Carriers must become more precise in their operations. Some drivers will leave the industry rather than switch, further tightening capacity. “If you’re not largely compliant, and then you have to go all the way to electronic logs, my sense is that’s going to be highly disruptive to the business models of people who aren’t,” he said. Recent history could offer a guide. ACT’s Vieth said spot market rates rose 25% year-over-year in March 2014 based on several factors. The most notable was tightened hours-of-service rules in 2013 that reduced capacity by 4%, a comparable amount with what he expects this time. The comparison with 2014 isn’t perfect. Other factors contributed to the change, including the polar vortex weather event in the first quarter of 2014, which reduced capacity. Also, Vieth said the 2013 hours-of-service rule was an immediate changeover, while the ELD mandate will be more gradual. After the 2014 spot market rate peak, carriers invested in more trucks, creating overcapacity, the economy didn’t keep pace and rates came down, Chainalytics’ Zweier said. But lately, the trend has been toward higher rates. In June, they averaged $1.80 per mile for dry van hauls, including surcharges, the highest monthly average since July 2015, according to Montague. Spot market freight volume and rates have increased sharply the past two Decembers, normally a quiet month. This December could mark a record as the ELD mandate coincides with late, e-commerce-based demand, Montague said. Truckstop.com’s market demand index, which includes spot market rates and truck-to-load ratios, is at an all-time high and could surge up to 20%. Like Schneider, C.R. England experienced a productivity impact of 3-5% when it made the switch to e-logs in 2009, but other fleets could see higher numbers because C.R. England employs many team drivers, Chief Sales Officer Brandon Harrison said. The fleet experienced an immediate and unexpected market disadvantage when it switched. Many 400- to 600-mile jobs went from a one-day haul to a shift-and-a-half, while competitors using paper logs still could price based on a day’s drive, Harrison said. Relays increased at least 50%, though that number fell over time. It took the company six months to a year to work through the changes and tweak its optimization model for planning and dispatch, he said. Salt Lake City-based C.R. England ranks No. 26 on the for-hire TT100. “For those carriers that are waiting to kind of flip the switch, and they’re waiting till the 11th hour, I think it’s going to be somewhat of a rude awakening for some of them,” Harrison said. The mandate will have other effects on the trucking business in addition to spot market and contract rates. Carriers will be able to charge for challenging service-level agreements, next-day service and long detention times, Montague said. As for drivers, they will demand higher pay per mile if they are driving fewer miles. Parking will continue to be an issue. Some shippers could switch to rail. He also expects 33-foot pup trailers used in less-than-truckload operations to take some business away from truckload carriers. The industrywide rollout of ELDs still is far from complete, however. Truckstop.com’s Boren said most of his company’s carrier customers operate one to 25 trucks, and that as of late July, 82% of those had not adopted the technology to meet the mandate. Moreover, carriers who wait until the last minute could find themselves unable to procure the technology as the Dec. 18 deadline nears. Boren said purchase and installation can take two to three weeks. He does not expect vendors to price gouge because there are so many. However, there aren’t many manufacturers, so if a vendor must expedite an order for a product that’s not in stock, the price could rise. “It’s not just as simple as, ‘OK, I need to get this device and plug it into my vehicle, and away I go,’ ” Boren said. Zweier, on the other hand, doesn’t expect becoming compliant to be particularly difficult because many technology options are available, some of them smartphone-based. Large freight brokers will assist smaller carriers in becoming compliant. Montague expects some industry consolidation. Large carriers already have adopted the technology, while smaller ones will need to adjust without the benefit of large trailer pools and the ability to run relays.